Monsignor Nunzio Scarano, a senior Italian cleric, has been arrested in connection with an inquiry into the Vatican bank scandal over allegations of corruption and fraud. Monsignor Nunzio Scarano works in the Vatican’s financial administration. A secret service agent and a financial broker have also been arrested. They are suspected of trying to move 20 million euros illegally into Italy. Pope Francis ordered an unprecedented internal investigation into the bank’s affairs in the wake of recent scandals. 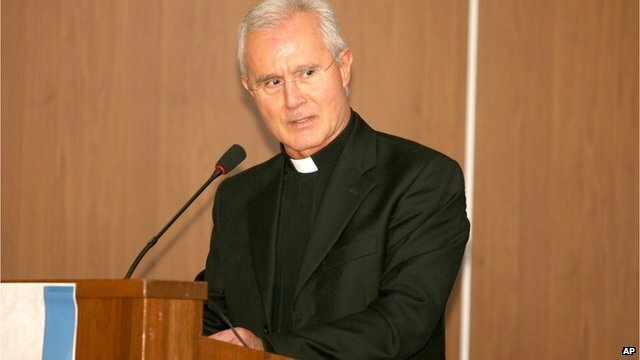 Monsignor Nunzio Scarano has been under investigation by Italian police for a series of suspicious transactions involving the recycling of a series of cheques described as church donations through the Vatican Bank. Earlier this month, the pontiff named a trusted cleric to oversee the management of the bank, which has been beset by allegations of money-laundering. Officially known as the Institute for the Works of Religion, the bank is one of the world’s most secretive. It has 114 employees and $7.1 billion (5.4 billion euros) of assets. Pope Francis has given the commission carte blanche, bypassing normal secrecy rules, to try to get to the bottom of scandals which have plagued the bank for decades. Traditionally, the Vatican Bank has refused to co-operate with Italian authorities investigating financial crime on the grounds of the sovereign independence of the Vatican city state. But Pope Francis has shown that he is now determined to get to the bottom of long-standing allegations of corruption and money-laundering by the bank. The Institute for the Works of Religion was a major shareholder in the Banco Ambrosiano, a big Italian bank which collapsed in 1982 with losses of more than $3 billion. Its chairman, Roberto Calvi, was found hanging from Blackfriars Bridge in London – in a murder disguised as a suicide. Roberto Calvi had close relations with the Vatican.